We do not doubt that white women in relationships with men of colour played a part in this demographic change in society. However, by placing white British women at the centre of a narrative about multicultural nationhood, Alibhai-Brown erases the contributions of millions of immigrants who have come to the UK and done the difficult work of integrating into a new society whilst enriching Britain with the best elements of their cultures. Worse still, in Alibhai-Brown’s version of multicultural Britain there is no space or recognition given to the children of these immigrants born in Britain today as the heirs and embodiments of a multicultural, ethnically-diverse and dynamic Britain. Far more sinister, is the subtle implication that ethnic diversity and multiculturalism in Britain is only legitimate when perpetuated through the blood of white British women. The irony is not lost on readers of colour that Alibhai-Brown, an immigrant woman of colour, writes herself out of the very Britain she imagines. Even more troubling than the non-contextualised use of the term ‘miscegenation,’ a word that is more appropriate in 19th century pseudo-scientific racism than in 21st century journalism, is the lazy, racist stereotyping of people of colour. Alibhai-Brown uses Lenny Henry and Lisa Makin, a white woman, as an example of a mixed couple in a new age of multiculturalism and integration in Britain. Her analysis of some of the public responses to their relationship soon becomes incoherent as she unexpectedly mentions the reactions of a handful of women of colour. She states, ‘Meanwhile, online, bitter single women of colour exchanged startlingly spiteful views about “their” men who pair up with Caucasian females.’ Alibhai-Brown then goes onto use the views of one black acquaintance to represent the views of all women of colour on this subject. The suggestion that women of colour, unlike their white counterparts, do not engage in interracial relationships or are somehow undesirable to ‘their’ [Alibhai-Brown’s emphasis] men is ludicrous, unfounded and quite random within the context of the article. It is striking too that this is the only explicit mention of women of colour in the entire article, who have raised their children, mixed race or first-generation immigrants, as British citizens for generations. Once again, the irony is not lost on readers of colour that Alibhai-Brown fails to imagine the lives of women of colour with a similar level of generosity and compassion afforded to the white women she praises so highly. What is perhaps most disturbing about the publication of Alibhai-Brown’s article is the portrayal of Black and Asian men in relationships with white British women. Alibhai-Brown routinely describes these men as ‘dark’ or ‘dusky’ with examples of their dangerous allure. In a deliberate contrast, Alibhai-Brown routinely describes the white British women profiled as ‘middle class’, ‘poised’ or ‘ladylike’ in what seems to be a desire to emphasise the singular lack of refinement amongst Black and Brown people. At one point, she notes that one of the Black men in question ‘didn’t look like a chap who should speak German’. We too wonder what chaps who speak German should look like? There are plenty of black men who sometimes feel rage about structural racism but they do not beat their partners. To be a black man is not to live in a state of uncontrollable rage which manifests in inevitable violence. Yet, the continued depiction of black and Asian men as dark, dangerous strangers would have us believe that unhinged black men are roaming the streets in search of salvation by gracious white women of social standing who will love and civilize them in ways black women never could. 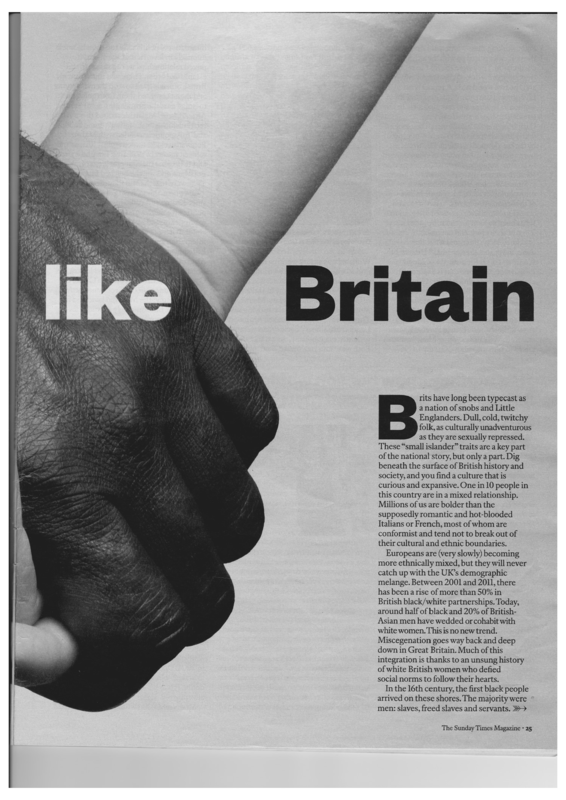 In short, the startling lack of nuance and racist language in ‘Blend it like Britain’ promotes harmful stereotypes about people of colour in Britain. What is most sinister is that their stories have been co-opted into a nationalist, self-aggrandizing narrative of white British femininity to divide and rule ethnic minorities in this country, without allowing them a voice to narrate their own experiences. Such a move betrays a lack of true respect for the humanity of people of colour in Britain but also fails to engage with the real complexities of being an ethnic minority in our multicultural society. Let us celebrate all contributions to this multicultural project. For without the struggle and courage of people of colour to live with dignity on this island, there would indeed be no multicultural Britain to speak of at all. Tele is based in London and is the co-founder of Diaspora Philes, a podcast series exploring questions on migration, identity and home which you can listen to here: www.diasporaphiles.com. She has lived in Nigeria, Chile and Colombia. You can find her on Twitter @girloguns or @DiasporaPhiles. I only have access to the start of the article you are criticizing, but do not wish to continue reading it… The reason? It says: “Millions of us are bolder than the supposedly romantic and hot-blooded Italians or French, most of whom are conformist and tend not to break out of their cultural and ethnic boundaries.”. My take is that it is an ode to whoever it is she is talking about, by trying to put down others. I very much agree with your article, though, and I too find it extremely problematic that the focus is on a black enraged guy and a martyr white woman. Thank you for your article :-).